The most wonderful time of the year may seem far off to most people, but as a designer, I’m already wrapping up Christmas orders for 2014. 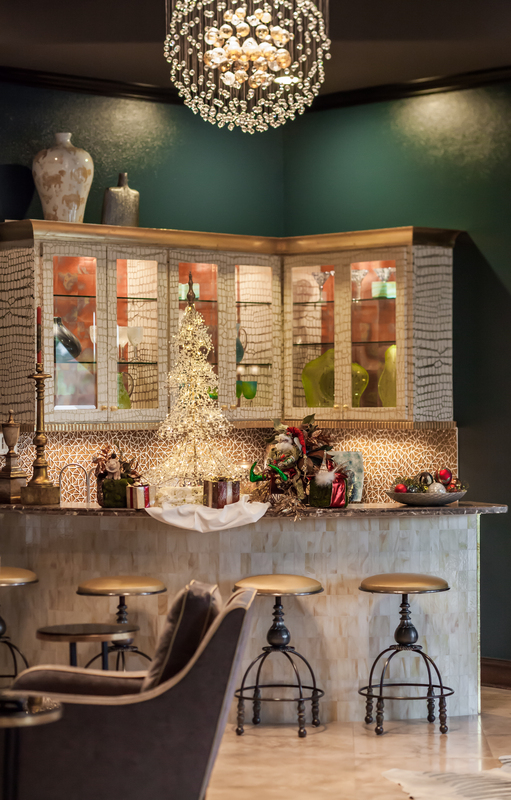 It takes an incredible amount of time and attention to decorate a home for Christmas, and as the holidays draw near, my team and I are already getting excited about festive new products and fresh design details to bring to our client’s homes. 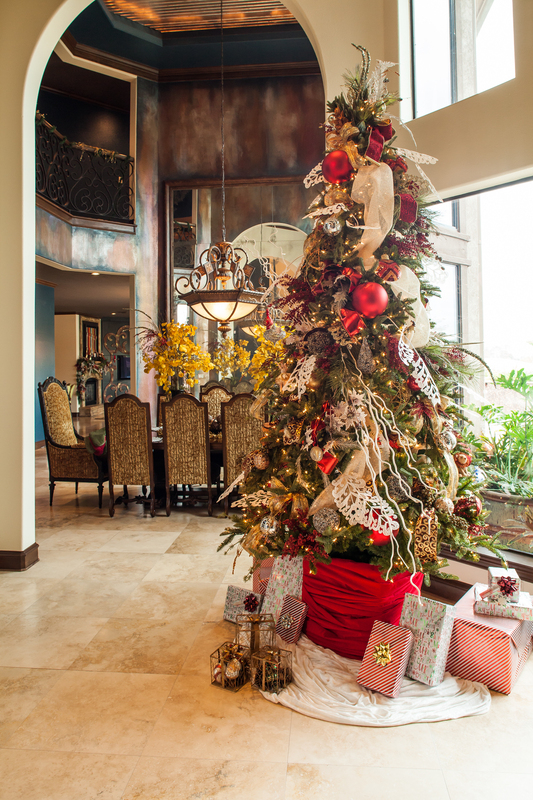 This post features a home that was decorated last year with sparkling and inviting Christmas garb, setting the perfect environment for a visit from Santa, meals with loved ones, and special memories. 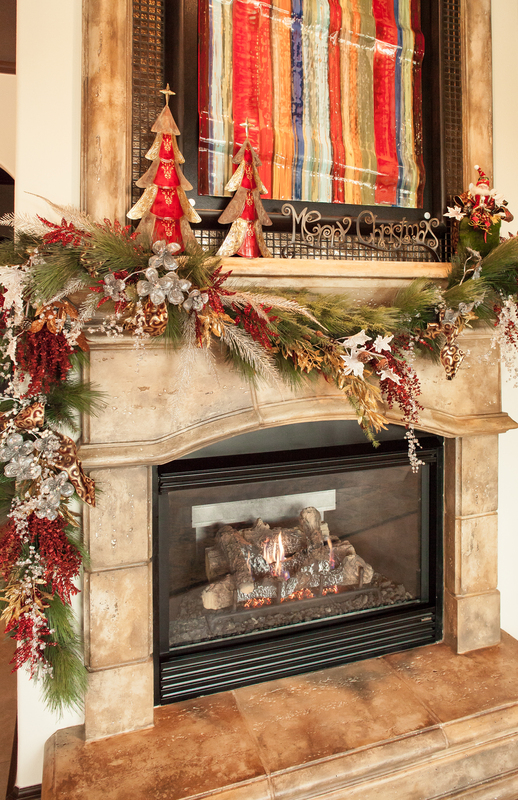 What are some of your family’s favorite Christmas decorating traditions? One of my favorite aspects of design is coming up with solutions that are both visually stunning and functional for the person or family living in the space. 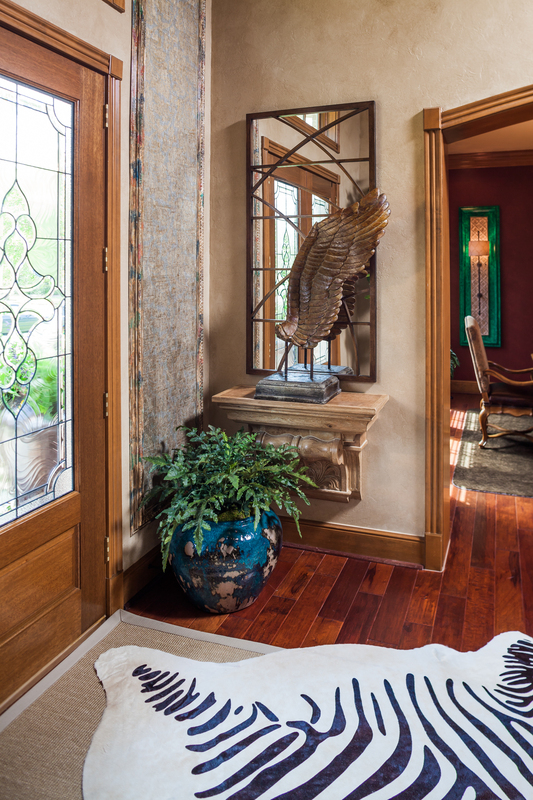 Every project brings some sort of challenge, and this entry way and powder bath redesign was no different. Let’s start in the entry way. This home features a two story entry way with a few feet of space on either side of the front double door. The space was too small to place a piece of furniture, but too big to go without a statement piece, so I had to find a way to make a splash without taking up a lot of room. 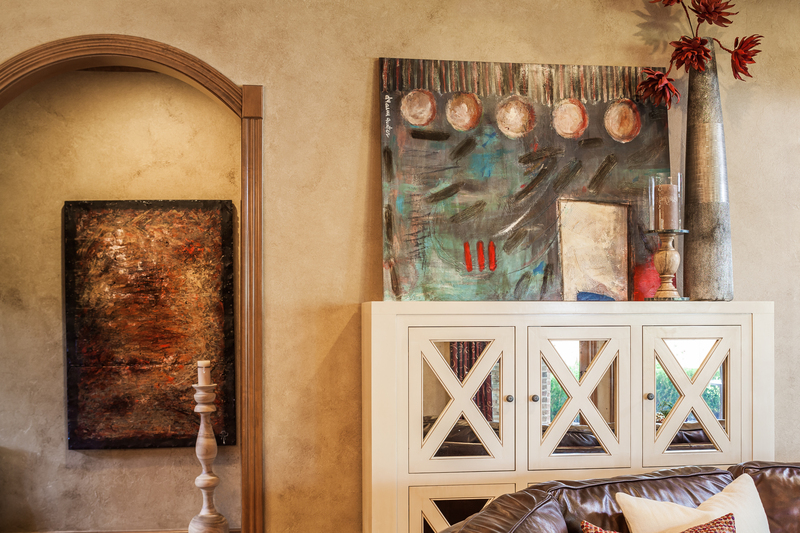 My solution was to take advantage of the wall height in order to draw the eye upward and create a more grandiose entrance to the home. I found a large decorative shelf that didn’t take up floor space and was only 12 inches deep, making it perfect for holding one large accessory. 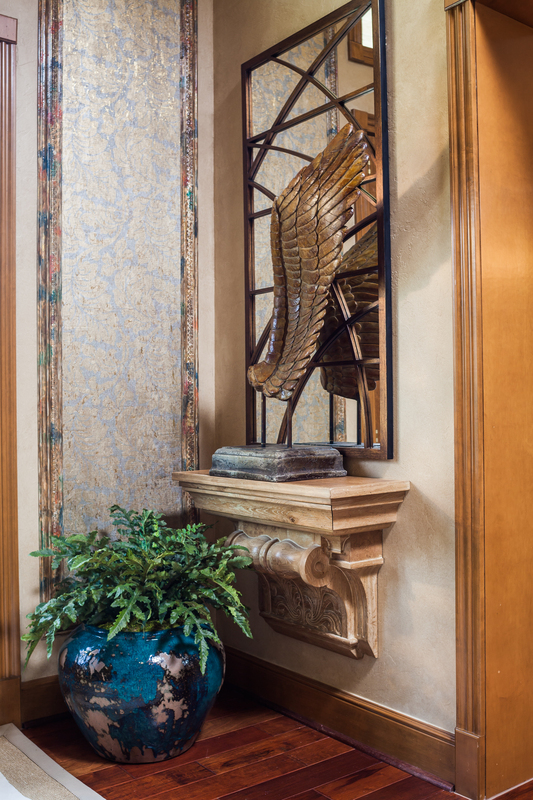 We hung the shelf several inches above the floor and topped it with a cool ceramic wing sculpture that works perfectly in the space and makes a bold statement. To enhance the look further, we hung a tall metal mirror above the shelf, which creates even more height. To complete the look, we created a 10 ft tall wallpaper panel with custom framing to mount in the space to the right of the front door. Tying the look together are a large potted plant and Zebra hide, which add warmth, whimsy, and texture to the space. Moving into the powder bath, we pulled in the same reds and blues that were introduced in the family area. 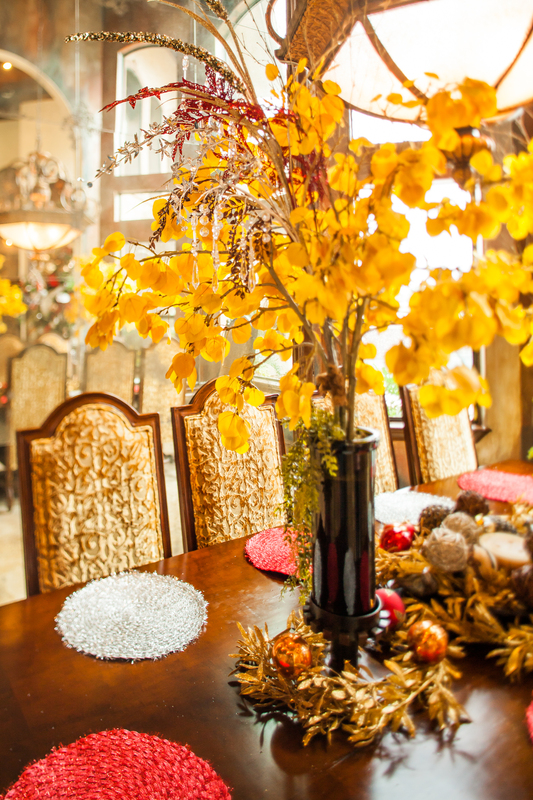 This additional splash of color makes things cohesive, colorful, fun, and reflective of the five person family who enjoys this home. To keep things simple and cost effective, we repurposed old fixtures, used the existing faux finish on the wall, and added a pop of color on the ceiling. In addition, new art, a one-unit porcelain sink and counter, vanity, and mirror were installed. 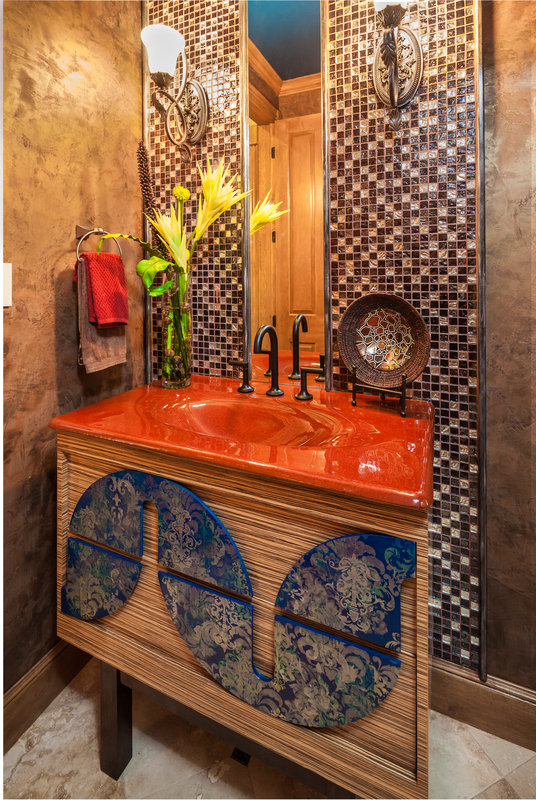 The vanity mirror was glued directly to the wall and then framed with mosaic tile from floor to ceiling, which creates a beautiful backsplash combination mirror. 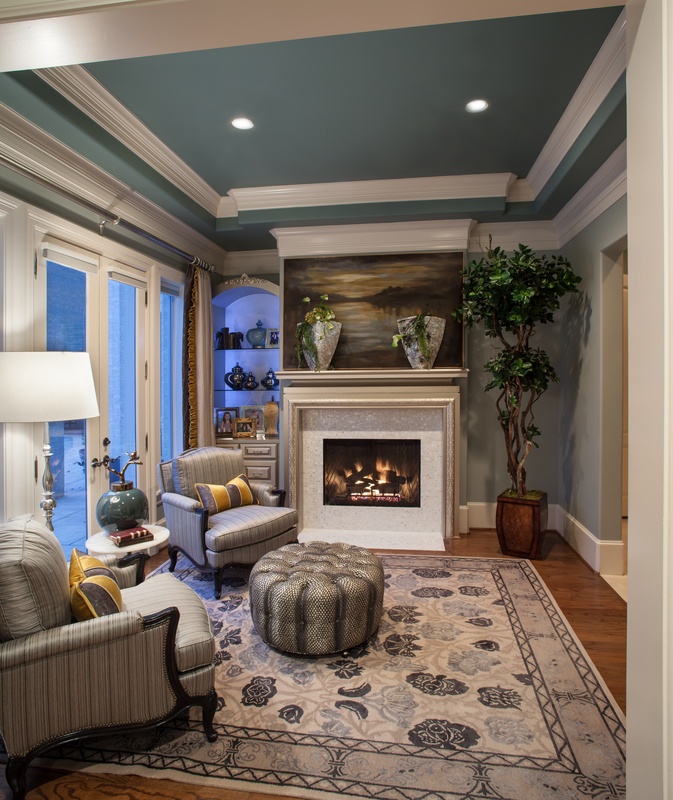 The finished product highlights the tall ceilings and brings an added dimension of color and texture to the space. Both myself and my clients were thrilled with the way this redesign turned out, despite the challenges presented. I’m thrilled to share that one of my favorite projects of 2013 is featured in the Jan/Feb issue of Design Bureau Magazine. If you aren’t familiar with this publication then I suggest you check it out because they publish some fabulous design ideas, and I am truly honored to be a part the current edition. 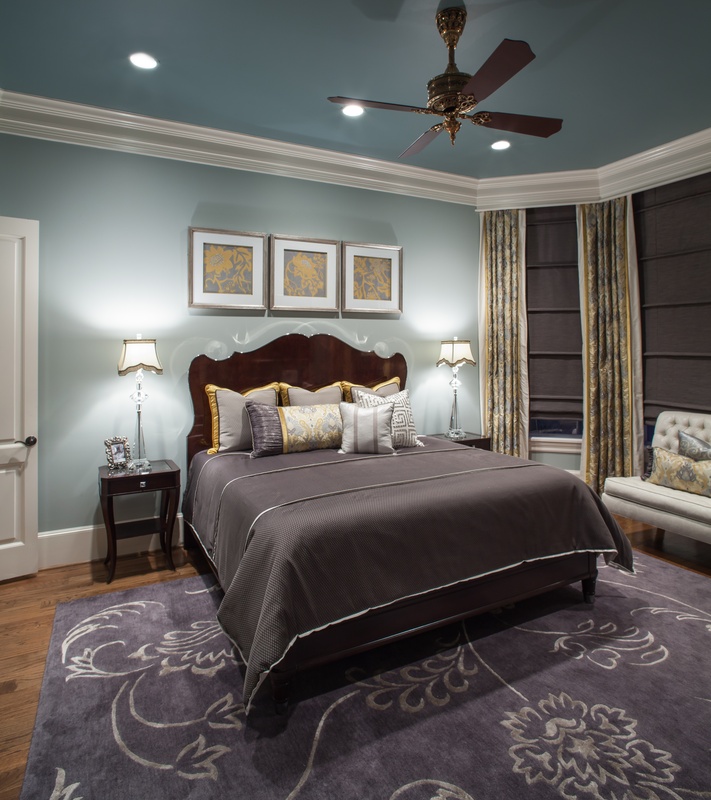 The feature is of a master suite and powder bath remodel. Nearly everything that you see, from the floors to the ceilings, was completely remodeled, and most all of the elements were either custom designed or custom ordered specifically for the client. I hope that you enjoy these pictures and learning a little bit more about what went into this project. With this remodel, my clients were looking for a completely new look. They wanted the design to be contemporary, not too fussy or over the top, with an element of glamour. I wasn’t given many specific parameters, but the look that we were going for was definitely classy, comfortable, and elegant. The inspiration for the color scheme of warm taupe, warm grays, fuchsia, and mustard/gold came from the unusual granite that I used in this master bathroom and closet. The granite is a unique quartzite- the base of the stone is a light grey-taupe and there are beautiful streaks of burgundy, raisin, and mustard yellow colors. The richness of the colors streaking through the granite inspired the rich color palette that you see in the bathroom tile, cabinetry as well as the bed frame, accent pillows, and wall color. 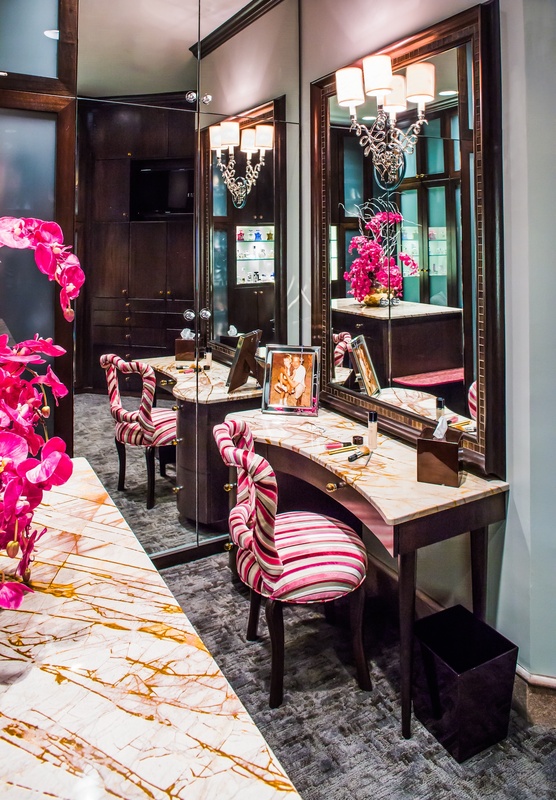 My goal for the space was to transform the look and feel to that of a retreat or luxury hotel. I wanted to create a comfortable, engulfing space for my clients to relax and unwind, or even escape into. When the window treatments are closed, the space truly wraps you up and makes you feel like you have been transported somewhere else. 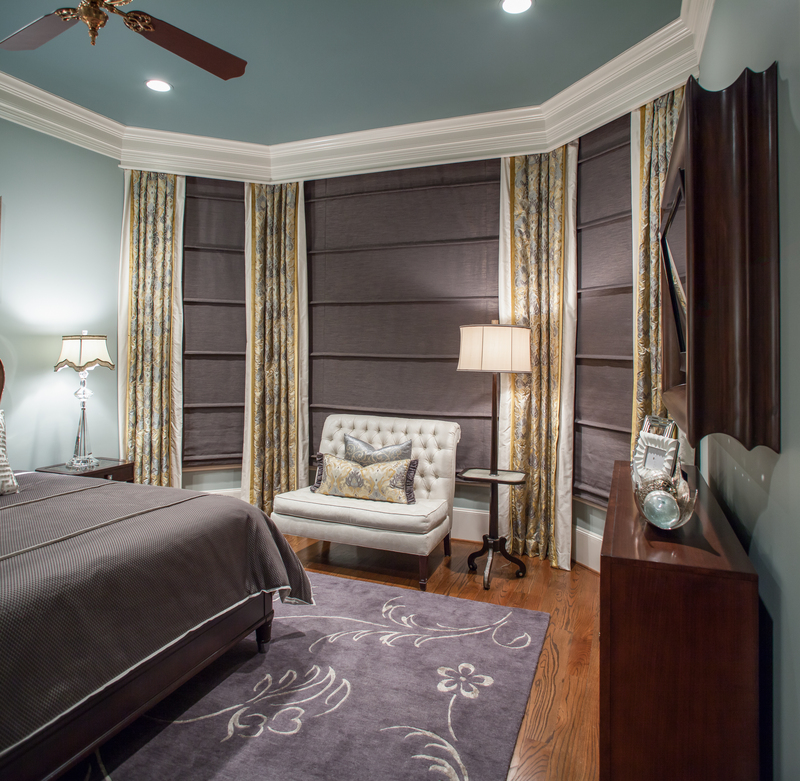 Furthermore, the decorative finish on the ceiling in the master bedroom utilizes metallics, taupes, and grays. The use of metallics on the ceiling brings light to the ceiling and draws the eye up. The effect that it creates really draws you in, engulfing you, and allowing you to experience the whole room. I have always been most inspired by color and texture, and I am constantly pushing myself to meet or exceed my clients’ expectations with exciting new color and fabric combinations. 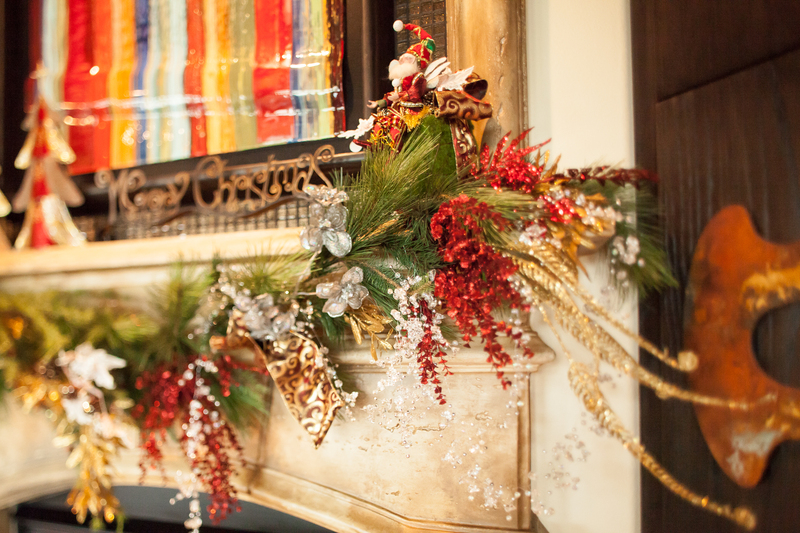 In this case, my clients were willing to go with a more bold color scheme, and I was excited to oblige. I am very comfortable working with color, it’s just part of who I am as a designer. 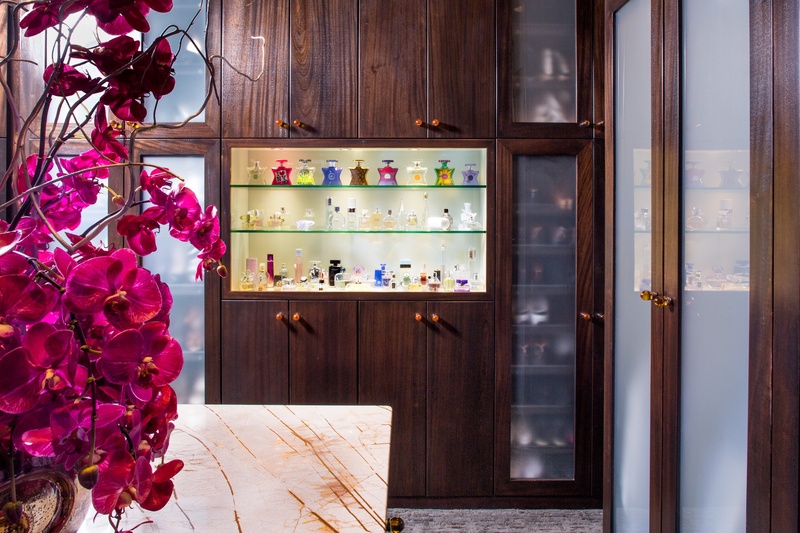 In the closet, my client wanted to display her extensive perfume bottle collection. We wanted the focal point of the display to be the perfume bottles, not the shelving, and so we used German seeded glass to frame out a box display piece for the perfume bottles. We then dropped in six, 11 watt LED lights, which threw an enormous amount of light into the space with very little reflection off of the glass or lighting. This installation kept the focus on the perfume bottles rather than on the shelving and or lighting. As you can see, a lot of detail went into this design. 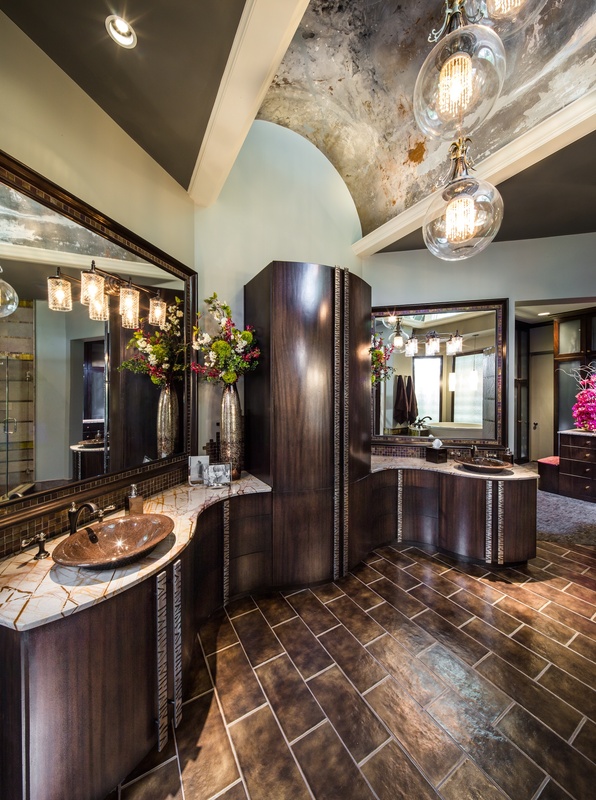 Some of my favorite stand out elements are, the Japanese soaking tub, custom cabinets in the master bath and the perfume bottle display in the master closet. One of my clients is part Japanese and he wanted to incorporate a subtle injection of his heritage into the design. We chose a more modern style Japanese soaking tub because it fit the space perfectly. We built it to look like a true soaking tub (even though the tub has its own built-in overflow), making it look as though the water will overflow onto the bed of rocks below. 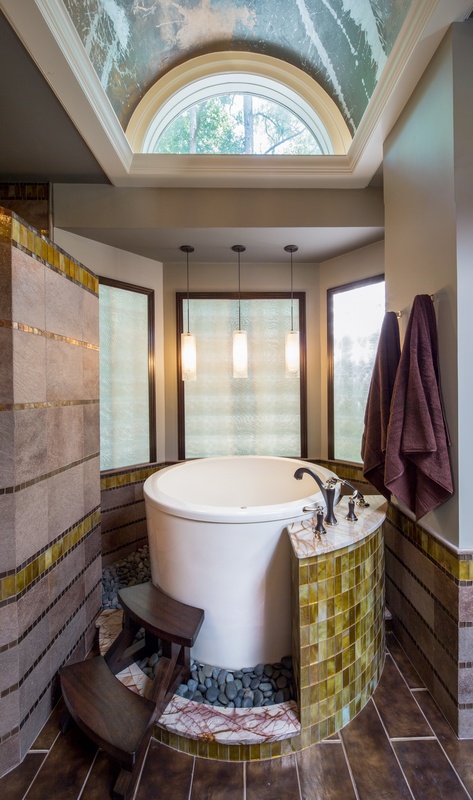 The master bath cabinetry was designed to compliment the curves of the Japanese soaking tub. The cabinets were custom built by a local custom cabinet company, and they did a great job of rising to the challenge and achieving the look that we had envisioned. 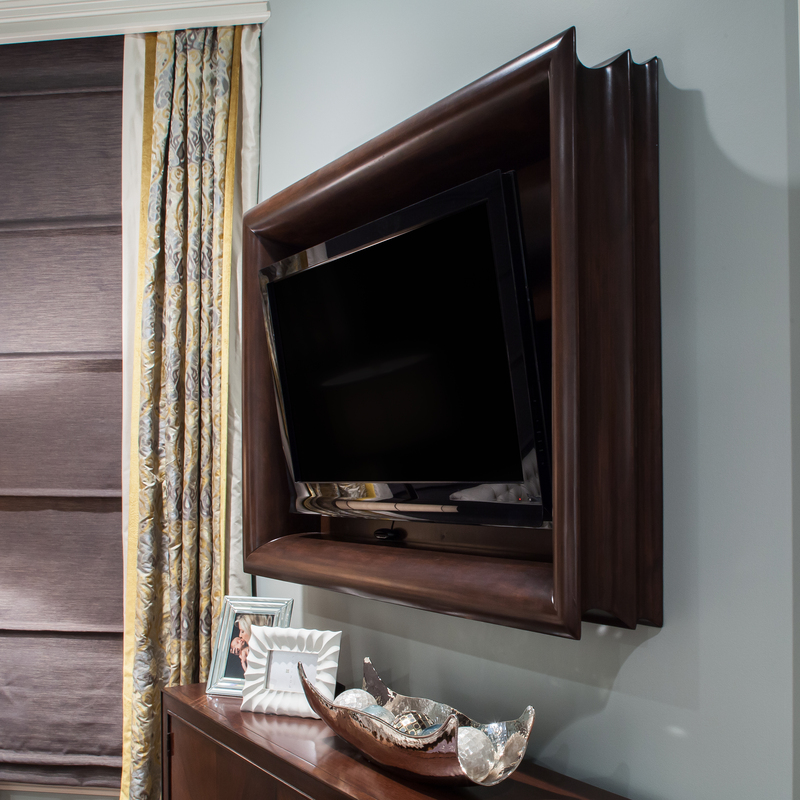 We chose to build flat panel cabinets without molding to achieve the fluid curvature that we were going for. The shape of the cabinets gives the relatively small and rigid space more movement, it also opens up the area and provides a more luxurious feel. Since the cabinets are so unique in shape and size, we had long, vertical hardware custom made to fit the cabinets perfectly. 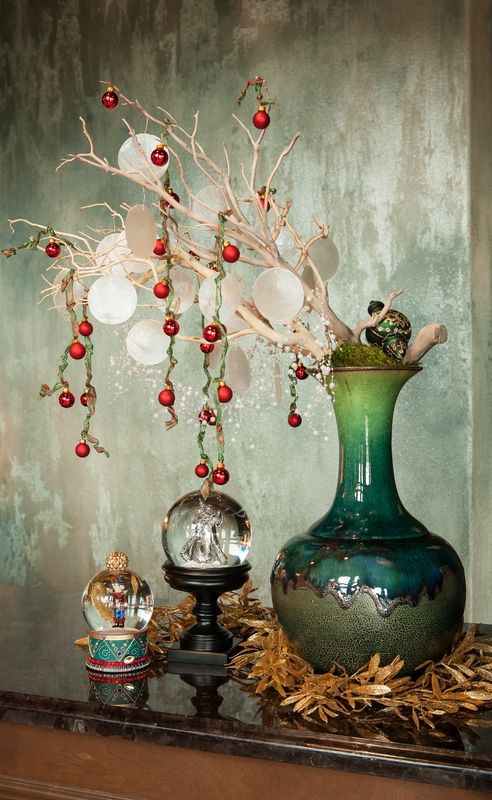 This final touch draws the eye upwards and embellishes the look, pulling everything together beautifully. When it comes to designing a powder bath, I love to make a statement. 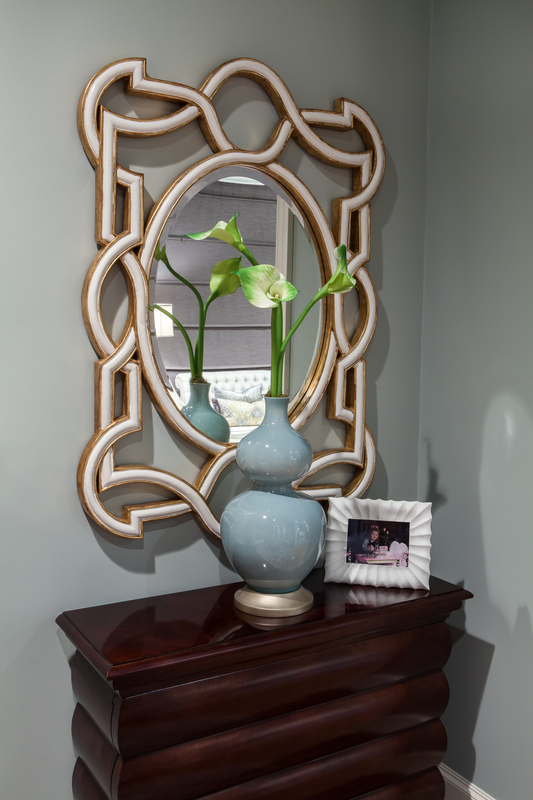 You can really push the design over the top in a powder bath since it’s a small area where not a lot of time is spent at once. 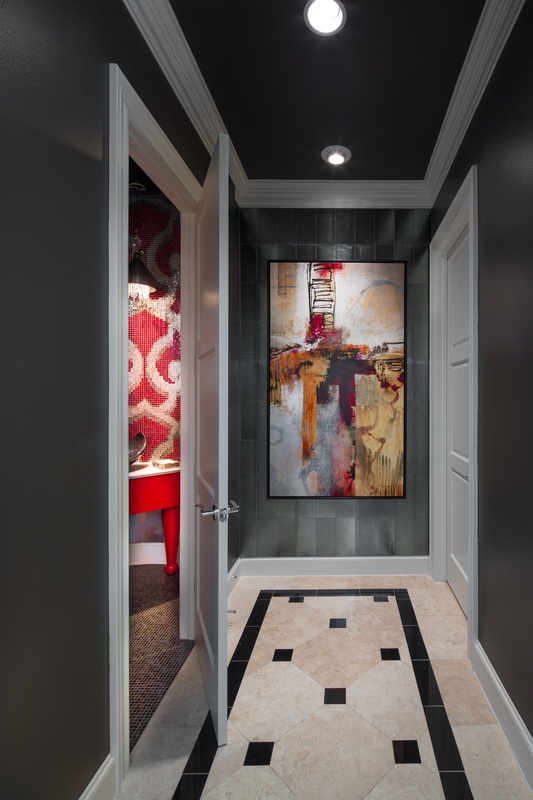 It also makes a lasting impression on guests who have access to the bathroom while visiting the client’s home. 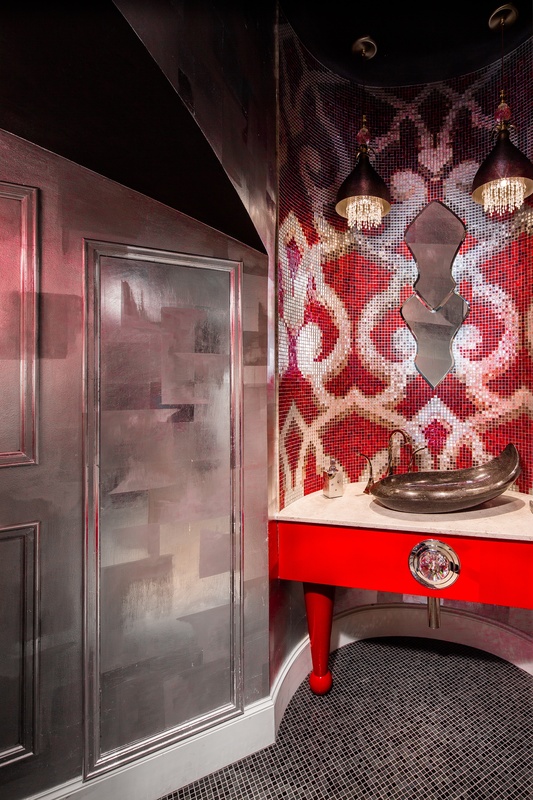 We tried several different red paints on the vanity before we found one that was just the right shade, which happened to be an automotive paint. It turned out beautifully because the high gloss finish of the auto paint really pops, it looks great with the mosaic tile. I also had the mirror custom made to mimic the design of the mosaic tile. The carved stone sink has great movement and is unique in its own right, which really seals off the look. I am excited to finally have a chance to share one of my favorite recent projects, a master suite remodel. When my clients came to me with a desire to redo their master bedroom, I was excited for the opportunity to design a space just for them. With two different, yet complimentary, personalities I knew the design had to be something sophisticated and beautiful. The husband is a stately, traditional man who is a well respected pillar in his community. The wife is a beautiful, energetic woman who loves life. When greeting you her face lights up, she makes everyone feel special. The blend of these two personalities is what gave me the inspiration for my design. 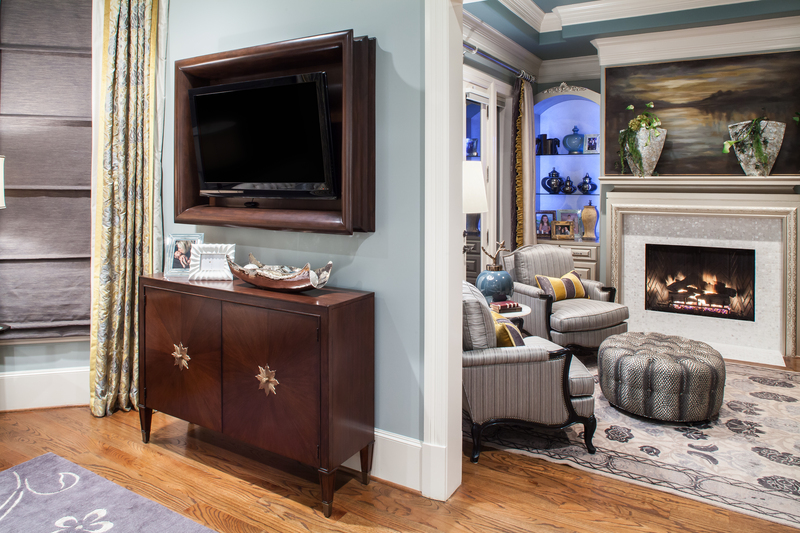 By blending traditional with modern glam, a space that was once an everyday bedroom was transformed into a gorgeous, sophisticated, transitional space that is peaceful to the heart and soothing to the eye. 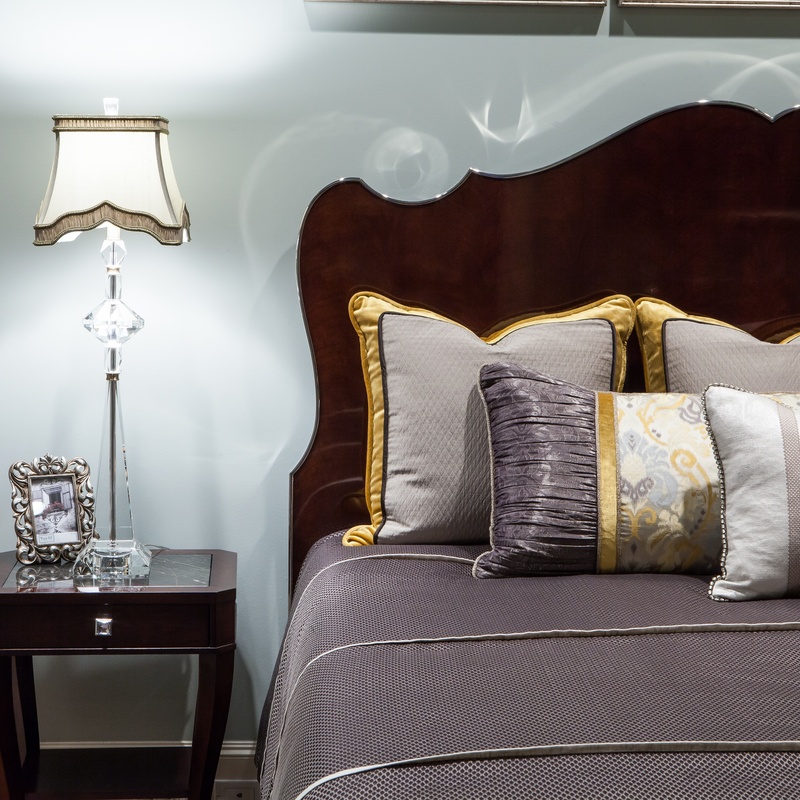 The reflection on the wall above the bed is the reflection of the polished stainless steel molding that frames the bed. This gorgeous detail set the standard in which everything else was selected. 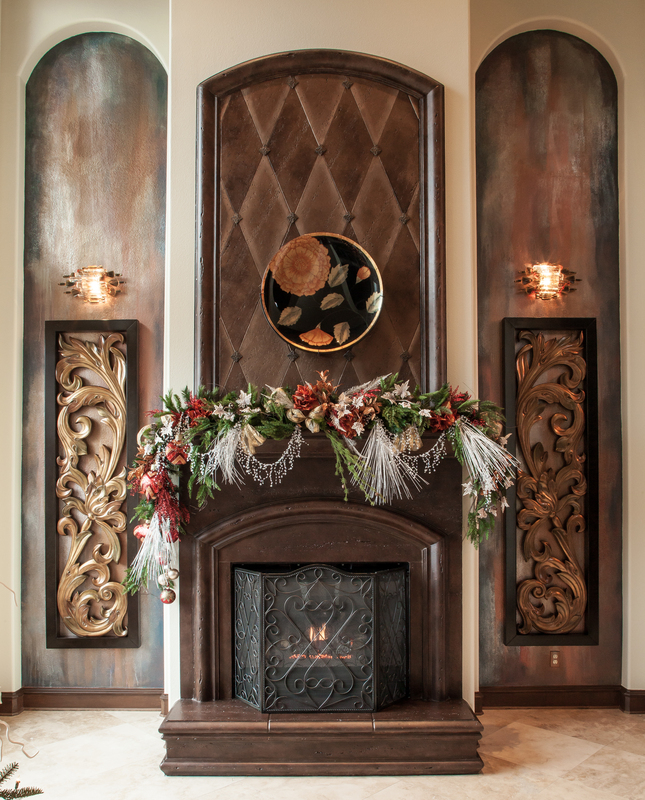 The built in to the left of the fireplace has a decorative finish with a fine reflective glitz that shows up very subtly when the LED lighting is turned on. To hide the wires and brackets for the TV, I designed a molding and frame that was custom built to hold the TV. 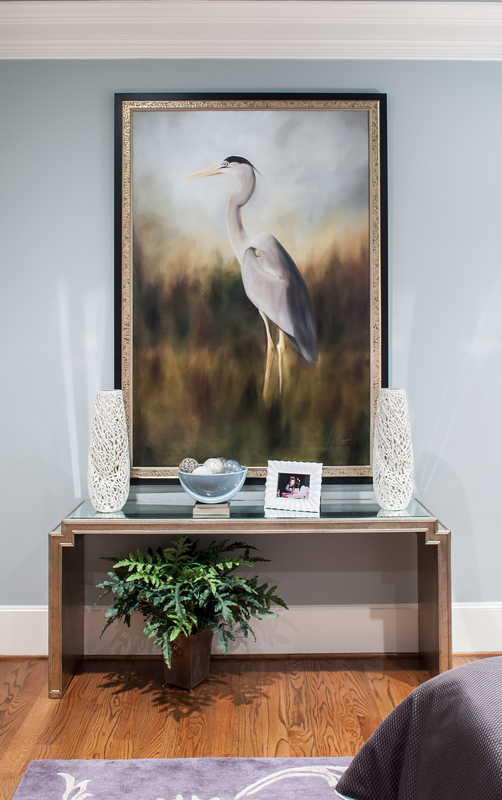 This oil painting, as well as the painting hanging above the fireplace, was custom painted specifically for the client and space. Hope you enjoyed these beautiful photos!